Modernised, well equipped 3 bedroom family bach with modern amenities. A five minute walk to the beach, parks and the local cafes (great food and cocktails). Three bedrooms (2 doubles and 1 with bunk beds), log burner and heat pump in lounge. Newly fitted, fully eqipped kitchen with dishwasher and Nespresso. Large section for relaxing in the garden, watching the kids play or sit on the heated covered deck with a cuppa or glass of wine. No tents or pets please. Extras: Cleaning (Required, NZ$50.00 per stay); All linen and towels included. We absolutely loved our stay! We couldn't have asked for nicer hosts! We were so lucky to stay in this home for the weekend of our wedding. Our hosts were incredibly accommodating and everything was so smooth. The home was modern, clean and tidy, and very comfortable. We highly recommend!! Very comfortable bach to stay in. Stylish and modern while retaining the cosiness of the bach lifestyle. 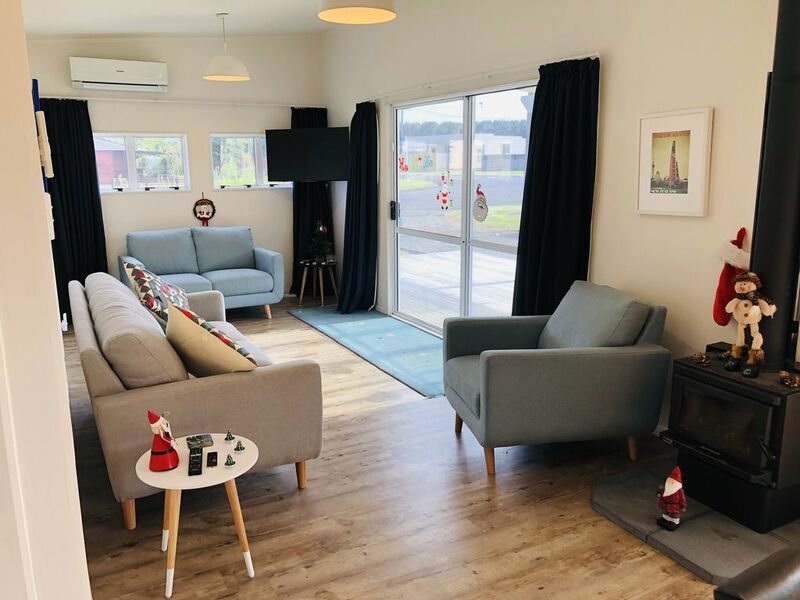 Certainly the place to stay in Foxton if you're wanting to escape the hustle of city life without sacrificing the conveniences of modern living. We had the best holiday staying at this holiday home. It has a modern kitchen and decor with lots of added luxuries e.g espresso, filtered water, a dishwasher and children’s toys. The location was great with the cafe close and it’s not far from the beach, bike track and park. The owner put up lovely Christmas decorations and stockings for our children which they loved and we appreciated the thoughtful gesture. Thank you for such a wonderful stay.